An example of this advertisement is available in The Milwaukee Journal (April 12, 1892), page 3. The World Health Organization, “Guide to Hygiene and Sanitation in Aviation,” 3rd ed, 2009; 55-6. Nearly four billion people flew in 2016. “Another Strong Year for Air Travel Demand in 2016,” The International Air Transport Association, February 2, 2017. Matt Phillips, “Airline Blankets: Nasty or Not?” Wall Street Journal, August 14, 2008. Catherine Sirna, “Delta launches exclusive Westin Heavenly In-Flight blanket for first class customers” (October 26, 2016). Three weeks before Trayvon Martin was killed, and two years before Michael Brown and Eric Garner, 18-year-old Ramarley Graham was shot and killed by Officer Richard Haste. Graham was unarmed and standing in his own bathroom. Haste’s hollow-point bullet, which New York City police officers have used since the department switched from full metal jackets in the late 1990s, did what it was designed to do. Michael Cooper, “New York Police Will Start Using Deadlier Bullets,” The New York Times, July 9, 1998. James D. Walsh, “The Bullet, the Cop, the Boy,” New York, June 14, 2017. Medical practitioners and psychologists had struggled since at least the Civil War to theorize and diagnose soldiers and veterans, given the physical and psychological duress induced by combat. For instance, Dr. Jacob da Costa diagnosed Civil War soldiers’ heart problems as “irritable heart.” The term emphasized the physiological effects of marching, lack of sleep, and malnutrition. But da Costa reasoned that these were conditions of what he called “hard service,” rather than effects of psychological trauma. Jacob M. da Costa, “On Irritable Heart: A Clinical Study of a Form of Functional Cardiac Disorder and Its Consequences,” The American Journal of the Medical Sciences 61, no. 121 (1871). For instance, Sigmund Freud, Charcot (1893). Standard Edition, vol. 3 (London: The Hogarth Press, 1962); Freud, Project for a Scientific Psychology. Standard Edition, vol. 1 (London: The Hogarth Press, 1950); William James, The Principles of Psychology (Cambridge: Harvard University Press, 1890); Jacques Dayan and Bertrand Olliac, “From Hysteria and Shell Shock to Posttraumatic Stress Disorder: Comments on Psychoanalytic and Neuropsychological Approaches,” Journal of Physiology-Paris 104, no. 6 (2010): 296–302. The term shell shock first appeared in The Lancet in 1915—six months after the start of WWI—in an article by an academic psychologist, Charles Myers, who had been involved with a volunteer medical unit in France. Though Myers was the first to introduce the term into medical discourse, combat soldiers may have invented “shell shock” to describe the physiological trauma associated with the technologies of modern warfare. As Tracey Loughran argues, the “act of naming was significant, not least because ‘shell shock’ posited a shell explosion as the central etiological event in these disorders.” “Shell Shock, Trauma, and the First World War: The Making of a Diagnosis and Its Histories,” Journal of the History of Medicine and Allied Sciences 67, no. 1 (2012): 94–119; 105. See also Charles Myers, “A Contribution to the Study of Shell Shock: Being an Account of Three Cases of Loss of Memory, Vision, Smell, and Taste, Admitted into the Duchess of Westminster’s War Hospital, Le Touquet,” Lancet 1 (1915): 316-20; Caroline Alexander, “The Shock of War,” The Smithsonian Magazine (September 2010); Marc-Antoine Crocq and Louis Crocq, “From Shell Shock and War Neurosis to Posttraumatic Stress Disorder: A History of Psychotraumatology,” Dialogues in Clinical Neuroscience 2, no. 1 (2000): 47-55; and Dayan and Olliac. 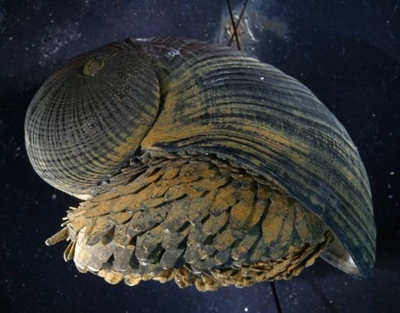 Anne Trafton, “Iron-plated snail could inspire new armor,” MIT News (January 27, 2010). Following Jane Bennett: “There is something to be said for moments of methodological naïveté, for the postponement of genealogical critique of objects. This delay might render manifest a subsistent world of nonhuman vitality.” Vibrant Matter, 17. To my knowledge, Parkman was the first historian to record the smallpox blanket strategy devised by Bouquet and Amherst during Pontiac’s War. Colin G. Calloway includes the “gifting” of smallpox blankets in his timeline on p. xvi of The Scratch of a Pen: 1763 and the Transformation of North America (Oxford: Oxford University Press, 2007). My summary of the Seven Years’ War and Pontiac’s War also come from this book. Cited in Elizabeth A. Fenn, Pox Americana: The Great Smallpox Epidemic of 1775-82 (New York: Hill and Wang, 2001); Philip Ranlet, “The British, the Indians, and Smallpox: What Actually Happened At Fort Pitt in 1763?” Pennsylvania History: A Journal of Mid-Atlantic Studies 67.3 (2000): 427–41; and Bernhard Knollenberg, “General Amherst and Germ Warfare,” Mississippi Valley Historical Review 41 (1954): 489-494. Knollenberg originally cited Trent in an attempt to exonerate Bouquet and Amherst, but later retracted after Donald Kent refuted Knollenberg’s claims in 1955. See Kent and Knollenberg, “Communications,” Mississippi Valley Historical Review 41.4 (March 1955): 762-63 and Mayor, 58 and 72-3 n. 5. The precise numbers have been debated and disputed since at least the 1960s, but as Jeffrey Ostler puts it, “If 75 million people lived in the Western Hemisphere in 1491 and the death toll from epidemic disease was 70, 80, or even 90 percent (as was sometimes the case), the sheer numbers (50-60 million) are overwhelming and compel recognition as genocide when measured against the numbers for commonly accepted cases of genocide in the twentieth century.” “Genocide and American Indian History,” Oxford Research Encyclopedia of American History (2015). Even still, Ostler seems skeptical of the smallpox blanket, or at least notes that the “evidence thus far has failed to dislodge a scholarly consensus that the intentional infliction of disease was rare.” See also Paul Kelton, Epidemics and Enslavement: Biological Catastrophe in the Native Southeast, 1492–1715 (Lincoln: University of Nebraska Press, 2007). The first known death related to HIV-AIDS was discovered in a sample of blood plasma from a man in Kinshasa in the Democratic Republic of Congo who died in 1959. The SIV, or Simian Immunodeficiency Virus, was likely something that the rand-capped mangabey and the greater spot-nosed guenon—two species of monkey—lived with for millions of years. But when chimpanzees started hunting these monkeys about 8 million years ago, SIV likely jumped to chimpanzees, who were later hunted and butchered by humans. SIV and HIV are retroviruses, which means that the virus begins with the RNA code (instead of DNA), and then translates it into DNA before it transfers itself to the DNA of its host where it proceeds with its life cycle. Gerald M. Boyd, “Reagan Urges Abstinence for Young to Avoid AIDS,” The New York Times, April 2, 1987. “The U.S.-Dakota War of 1862,” The Minnesota Historical Society. Hal J. Cole, agent at the Colville Indian Agency in present-day Washington describes in his 1890 report: “The population is placed at 1,715 of which 300 is estimated; the number of actual names obtained is 1,415. The Indians are making progress in civilization; still the blanket Indian is more numerous than he should be. I found many more ‘blanket’ Indians here than I anticipated on coming to assume charge of the agency…”. The category of “Indian” was added to the census in 1860, but census takers were instructed only to include Native Americans whom they considered to be properly assimilated. The census did not attempt to count Native peoples officially until 1890, at which point enumerators typically used blood quantum to determine a person’s proper category. The inclusion of Native Americans in the census demarcates a settler-colonial ideology that understands indigeneity as a racial and ethnic category, rather than Native peoples’ status as tribal citizens of their nations. Robert W. Kapoun mentions the “blanket Indian” category in the 1890 census in Language of the Robe: American Indian Trade Blankets (Peregrine Smith Books, 1992), 17. Isabel Crawford writes about Native peoples as “the kind with blankets, feathers, and paint” in Kiowa: A Woman Missionary in Indian Territory (1915), (Lincoln: University of Nebraska Press, 1998), 88. The 1915 version was called Kiowa: The History of a Blanket Indian Mission. A 1911 advertisement for The Pacific Monthly in Life uses the phrase “blanket Indian” to describe how eastern U.S. people think of the west as “uncivilized.” “Advertisement 30,” Life 58.1500 (July 27, 1911): 164. I thank Jessica Cowing, not only for introducing me to this source, but for helping me understand the entangled discourses of health, ableism, civility, and heteronormativity in boarding schools. And in 1879, Pratt sought and secured permission from the Secretary of the Interior and the Secretary of War to use the Carlisle Barracks—an Army installation established in 1745—as the site for the off-reservation boarding school. The former school is now a site for a military school, the U.S. Army War College. For more on Ft. Marion see Diane Glancy, Fort Marion Prisoners and the Trauma of Native Education (University of Nebraska Press, 2014); Donal F. Lindsey, Indians at Hampton Institute, 1877-1923 (Urbana: University of Illinois Press, 1995), 27-33. For more on Pratt, Ft. Marion, and the militarization of boarding schools see Brenda J. Child, Boarding School Seasons: American Indian Families 1900-1940 (Lincoln: University of Nebraska Press, 1998), 5-6. And for more on Carlisle and Pratt see David Wallace Adams, Education for Extinction: American Indians and the Boarding School Experience, 1875-1928, (Lawrence: University Press of Kansas, 1995). Hakiktawin’s statement was made to E.Y. Berry, a Notary Public, in January 1934. See also David W. Grua, Surviving Wounded Knee: The Lakotas and the Politics of Memory (Oxford: Oxford University Press, 2016) and Julian Brave Noisecat and Anne Spice, "A History and Future of Resistance" Jacobin (2016). During Peltier’s 1977 trial, an FBI ballistics expert testified that a casing found near the agents’ body matched a gun that belonged to Peltier. However, the test that proved no connection between the casing and his gun was concealed and not introduced at the trial. Before 1931, the cost of pruning and removal was the responsibility of property owners. After the 1932 Olympics, the Public Works Administration sponsored a Master Tree Plan, and from 1933-1935, funds from the state gas tax covered tree maintenance on major streets and state highways. “The History of Urban Forestry Division,” Bureau of Street Services and Department of Public Works for the City of L.A., 2017. The Indian Fig, or ficus, takes only 30-40 years to grow above the roofline of an average ranch house. The California Live Oak, a native species, takes much longer to grow, and so city developers went with ficus. “L.A. agrees to spend $1.3 billion to fix sidewalks in ADA Case.” Emily Alpert Reyes, Los Angeles Times, April 1, 2015. For a concise history of the ADA and its crucial predecessor, Section 504 of the 1973 Rehabilitation Act, see Lennard J. Davis, Enabling Acts: The Hidden Story of How the Americans With Disabilities Act Gave the Largest Us Minority Its Rights (Boston: Beacon Press, 2016). Stripe Hand Towel (2011) makes a similar argument: With acrylic paint, Saban creates an uncanny hand towel that covers a 20 x 16 x 1 ¼ inch canvas. Three edges of the canvas are visible, again, just enough to evoke the conventional relation of canvas to paint. Analia Saban: The Whole Ball of Wax (New York: Gregory R. Miller & Co, 2017), 14. Some of the cuts in the Calacata Borghini quarry date back to the Roman Empire. M. Pilar Lapuente, Bruno Turi, and Philippe Blanc, “Marbles From Roman Hispania: Stable Isotope and Cathodoluminescence Characterization” Applied Geochemistry 15, no. 10 (2000): 1469–93. Interview with the author, July 26, 2017. To visit the marble mines in the Apuan Alps, visitors must hire guides or take a private jeep tour, and the yet the material is made perversely available and accessible for home renovation. A highly adaptable material, concrete is an aggregate of broken stone or gravel mixed with sand, cement, and water. Ancient Romans mixed pozzuolana (volcanic earth) with lime, broken stones, and tuff to create concrete for roads and large buildings; cement was not a component of concrete until the mid-19th-century. See “Concrete” in The Columbia Encyclopedia (New York: Columbia University Press, 2017). “Marble in Afghanistan,” a brochure available from Afghanistan’s Ministry of Mining, describes an industry that “suffers from a lack of adequate equipment, has little technical knowledge, and uses poor extraction methods that often significantly reduce the value of the marble.” The marble is extracted from twelve different provinces, then exported to Pakistan in rough-hewn blocks to be proceeded, then transported back to Afghanistan. An updated version of the brochure concludes with a call to private and foreign investors to help “develop the huge and very diverse mineral resource potential of Afghanistan.” Ministry of Mines and Petroleum and United States Agency of International Development (USAID), January 16, 2014. I’ve simplified Deleuze’s metaphor somewhat, since he folds yet another analogy into marble, “like an undulating lake full of fish” (229). I think of this somewhat like Carlo Rovelli’s description of space as matter: “We are not contained within an invisible, rigid infrastructure: we are immersed in a gigantic, flexible snail shell. The sun bends space around itself, and Earth does not turn around it because of a mysterious force but because it is racing directly in a space that inclines, like a marble that rolls in a funnel.” Carlo Rovelli, Seven Brief Lessons on Physics (New York: Riverhead Books, 2016), 8. “Navajo Ute First Phase Blanket, ca. 1850,” Antiques Roadshow, video, 3:48, accessed July 2017. See also Donna Haraway, Staying With the Trouble: Making Kin in the Chthulucene (Durham: Duke University Press, 2016, 89-97. Dah iisl’ó Bizaad was installed in the Hear My Voice: Native American Art of the Past and Present exhibition at the Virginia Museum of Fine Arts (Richmond, Virginia: August 19, 2017-November 26, 2017). The quotes by Begay here accompany her blanket. They originally developed TilePile for the Barrio Anita Mural Project in Tucson, AZ. According to the Indian Health Service (IHS), Native/Indigenous people “have the highest rates of type 2 diabetes in the United States.” “Special Diabetes Program for Indians,” Indian Health Service, October 2016. IHS reports that the prevalence of diabetes (type 1 or 2 is not specified) in Native/Indigenous people in 2012 was 35% for those 65 and older, between 20-25% for those 45-64, 5% for those 20-44, and between 0-5% for those under 20. “Changing the Course of Diabetes: Turning Hope into Reality,” Indian Health Service, Special Diabetes Program for Indians, 2014 Report to Congress, 2. Colleen Kim Daniher also reads this piece as a critique of blood quantum and DNA tests that attempt to quantify one’s genetic inheritance. This argument certainly links up with Lord’s body of work, which critiques, enlivens, and grapples with the experience of living with a mixed cultural identity, moving between disparate spaces, and always existing “somewhere in between” in terms of her notion of home and culture. See “The Pose as Interventionist Gesture: Erica Lord and Decolonizing the Proper Subject of Memory,” Hemispheric Institute E-Misphérica 11.1 (2014). The quote about Bedell’s hide post comes from John M. Motter, “Did Army Make Dutch Henry an Outlaw?” Pagosa Springs Sun (September 19, 2002). For more on the eliminatory and acquisitive strategies of settlers see: Patrick Wolfe, “Settler Colonialism and the Elimination of the Native” Journal of Genocide Research 8, no. 4 (2006): 387–409 and Nicholas A. Brown, “The Logic of Settler Accumulation in a Landscape of Perpetual Vanishing,” Settler Colonial Studies 4.1 (2014): 1–26. Kuntz sold the blanket to an anonymous buyer who then donated it to the Detroit Institute of Arts. Connie Butler, “Jeanine Oleson: Conduct Matters” Hammer Project (Los Angeles, CA: May 2017). Exhibition brochure. Jon Yeomans, “No End in Sight for Strike at BHP Billiton Copper Mine in Chile,” The Telegraph, March 15, 2017. Quoted in Alex Teplitzky, “Jeanine Oleson’s Critique of Capitalism Through Craft and Humor,” Creative Capital, May 25, 2017. “Food or blankets?” The Lancet vol. 341, issue 8857 (May 29, 1993), 1407. Morrigan McCarthy, “Harvey in Pictures,” The New York Times, August 27, 2017. The specific photo I refer to is by Edmund D. Fountain. Emily Crockett, “It could take years for Texas abortion clinics to reopen, even after a Supreme Court victory,” Vox, June 27, 2016. Texas Senator John Cornyn released the following statement after the ruling: “Today 5 activist judges on the Supreme Court struck down key provisions of Texas’ pro-life omnibus bill. This law not only protected unborn life, but required that doctors be qualified when providing life threatening procedures and that these procedures be done in a safe environment.” “Texas Republicans Slam Supreme Courts’ HB2 Ruling,” June 27, 2016, accessed September 2017. Ginsburg, J., concurring, Whole Woman’s Health, et al., Petitioners v. John Hellerstedt, Commissioner, Texas Department of State Health Services, et al., 579 U.S. 2 (2016). See also Mark Joseph Stern, “Supreme Court Strikes Down Texas Abortion Restrictions,” Slate, June 27, 2016. “The Thomas Kay Collection: A Pioneer’s Legacy,” March 2013. See History of the Confederated Tribes of the Umatilla Indian Reservation for an overview of the history that leads to the settler nation forcing tribes onto the reservation in the early 1860s. For an in-depth study and history of this region and its Native peoples, see Andrew H. Fisher, Shadow Tribe: The Making of Columbia River Indian Identity (Seattle: University of Washington Press, 2010). Conversation with George Ciscle, December 15, 2017. Ciscle, former director of the MFA in Curatorial Practice at the Maryland Institute College of Art (MICA), curated the first exhibition of Elizabeth Talford Scott’s lifelong work in 1998. Ciscle also conducted extensive oral interviews with Scott, and these comprise a rich and invaluable archive of her life and work. All references and attributions cited in Blanket come from Ciscle’s interviews and the exhibition catalogue. In the genealogy of Black Codes and convict leasing, chain gangs were another post-abolition method to criminalize and incarcerate African Americans. Georgia was the first state to institute chain gangs to force male convicts into arduous labor—chains were wrapped around their ankles, and men were shackled to fellow prisoners while they worked, ate, and slept. Chain gangs were abolished in the 1950s, but as recently as 1995, the Staton and Limestone correctional facilities in Alabama reinstituted chain gangs. Greg Abbott (@GregAbbott_TX), Twitter, October 28, 2015. Tessa Stuart, “2015: The Year in Mass Shootings” Rolling Stone (December 3, 2015). In Poetics, Aristotle states: “Liveliness is especially conveyed by metaphor, and by the further power of surprising the hearer; because the hearer expected something different, his acquisition of the new idea impresses him all the more” (1412 a, 18-24). INCLUDE an IMAGE of the BLANKET Throughout, I use the term Oceti Sakowin to refer to people of the Seven Council Fires—in dominant/settler discourse, the “Sioux” and “Great Sioux Nation.” The Council Fires—formed according to kinship, language, and geographic proximity—are: Mdewakanton, Wahpekute, Sisitonwan/Sisseton, Wahpetonwan, Ihnaktown/Lower Yanktonai, Ihanktowana/Upper Yanktonai, and Tetonwan. There are seven bands of the Tetonwan/Teton, or people of the plains: Hunkpapa, Sicangu/Brule, Itazipo/Sans Arc, Sihasapa, Oglala, Oohenumpa, and Mniconjou. Oyate refers to people—the communities and bands that comprise the Oceti Sakowin. For a smart and historicized take on the alliances between farmers/ranchers and Native nations (beyond the “Cowboys and Indians” discourse in the mainstream press), see Zoltán Grossman, Unlikely Alliances: Native Nations and White Communities Join to Defend Rural Lands (Seattle: University of Washington Press, 2017). Iŋyaŋ Wakháŋagapi Othí or Sacred Stone is the pre-colonial term for Cannonball in present-day North Dakota on the reservation lands of the Standing Rock Sioux Nation. Late 18th–19th-century Hudson’s Bay Company blankets were typically red, blue, or white—all with black bars—but according to Harold Tichenor, Kwakiutl and Nuu-Cha-Nuth peoples (along the west coast of Canada) “favored green blankets” (40). The Blanket: An Illustrated History of the Hudson’s Bay Point Blanket (Toronto: Madison Press Books, 2002). The Plymouth Historical Museum in Michigan installed an exhibition for over five years, “Quilts of the Underground Railroad,” which presented the thesis from Hidden in Plain View. “Unraveling the Myth of Quilts and the Underground Railroad.” Time (April 3, 2007). Tobin narrates her first encounter with Mrs. Williams, and later a telephone call in which Mrs. Williams told her ‘Don’t worry, you’ll get the story when you’re ready” and then hung up. Tobin didn’t speak to Mrs. Williams again for three years when she found her in the same market and Mrs. Williams began to relay the details of the code system. See pp. 15-23. Given this chapter’s focus, my own commitments and knowledge-base, and the accelerations and propulsions of Blanket more generally, I must leave an in-depth engagement with the rich histories and ongoing practices of African-American quilting to others—especially to those whose memories and forms of inheritance belong to the legacies of this extraordinary practice. My understanding and knowledge have been instrumentally shaped by contemporary quilters like Dr. Joan M.E. Gaither and Dr. Riché Richardson; and their work deserves its own scholarly treatment. I want to thank Professor Richardson, especially, for inviting me to her studio in 2005-2006 to view some of her exquisite quilts, and for teaching me, both in and outside the classroom, about quilts as collective memory, as forms of embodiment. For engaged studies of African American quilters and quilts, see: Patricia A. Turner, Crafted Lives: Stories and Studies of African American Quilters (University Press of Mississippi, 2009); William Arnett, et al., The Quilts of Gee’s Bend (Tinwood Books, 2002); Carolyn Mazloomi, Spirits of the Cloth: Contemporary African American Quilts (Clarkson Potter, 1998); Gladys-Marie Fry’s Stitched from the Soul: Slave Quilts from the Antebellum South (University of North Carolina Press, 1990) and a special issue in the journal Interdisciplinary Humanities devoted to African-American quilts and quiltmaking, vol. 25 issue 2 (Fall 2008). Miller characterizes the quilt code as perhaps “the first language in the New World, this geometric language of patterns,” which gravely overlooks the innumerable languages of Native/Indigenous peoples spoken and signified in rock, textiles, hides, on pottery and other materials for thousands of years on Turtle Island. This is an especially unfortunate oversight given that Miller himself notes that Frederick Douglass Circle is a counternarrative to (Christopher) Columbus Circle in Manhattan. Blight is professor history at Yale, and the editor of a book on the Underground Railroad, Passages to Freedom: The Underground Railroad in History and Memory (New York: Harper Collins, 2004). And his book about Douglass, Frederick Douglass’ Civil War: Keeping Faith in Jubilee (Baton Rouge: Louisiana State University Press, 1989). The first iteration of Blanket Stories was installed at the National Museum of the American Indian in late 2004. Though the Company was not the first to introduce the wool point blanket, it formally adopted it in 1780. Artist correspondence with the author, August 12, 2017. Donald Hopkins, Princes and Peasants: Smallpox in History (Chicago: University of Chicago Press, 1983). Mark Rifkin, Beyond Settler Time: Temporal Sovereignty and Indigenous Self-Determination (Durham: Duke University Press, 2017), 61. See also Scott W. Berg, 38 Nooses: Lincoln, Little Crow, and the Beginning of the Frontier’s End (New York: Pantheon, 2012).